After a hectic day of feel-good factor is paramount. This also means saying goodbye to the uncomfortable work clothes and slip into more comfortable clothes. Many probably the pajamas the first choice, because it is characterized by a high wearing comfort. This is important not only for relaxed hours on the sofa, but especially for a restful night. For this reason, pajamas for ladies manufactured and convince with loose sections of skin-friendly and supple materials. In fashionable design, you have to in no way dispense: With stripes, prints and checks prove a sense of style in the bedroom. Read on to find how you can make your sofa even more relaxing! Pajamas should be selected not only according to personal taste, but also on the season.Because if you sweat or freeze, you will not be able to sleep relaxed. The long-sleeved pajamas are just right for the winter. They consist of a long pants and a long-sleeved top.Also, there are variants with short sleeves, which are ideal for the transition times.Particularly useful are pajamas for ladies with cuffs are provided. These ensure that the sleep ride up anything and your limbs remain covereth. Equally popular are the classic versions with further pants and a buttoned shell- this work properly with its elegant lapel collar. Just as important as the cut is the material. Because this ensures optimum thermal insulation. There is nothing better than watching to slip into the cozy pajamas. Cotton flannel is particularly well: The fabric convinces with a very soft surface which is very smooth.This is caused by a one-sided or two-sided roughening of the substance. Heat is particularly well stored, moreover, the material is light and absorbent. A pajama flannel, you can easily use the washing machine at 30 to 40 degrees. 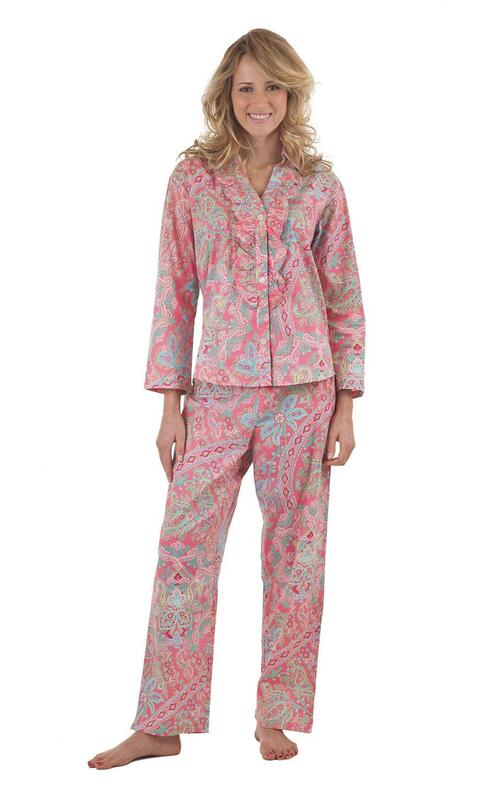 For the less cold nights pajamas are ideal for women in cotton jersey. The material is less heat-insulating, but breathable, skin-friendly and moisture absorbing. In addition, it is just as easy to maintain as flannel and can be cleaned in the machine therefore easy. Make sure in any case that you are not dressed too warm for sleeping. If you sweat too much, it may cause the moisture to hypothermia. Learn the following tips on what to look for when sleep also. Sometimes even the best pajamas does not help falling asleep. With a few simple tricks you can tackle the sleep relaxed. Find a rhythm: Go best always at the same time to go to bed and you are tomorrow at the same time. The body learns when to be tired. Reassurance by aromas: fragrant aromatic oils such as lavender, vanilla or cinnamon can significantly contribute to relaxation and increased sense of well being. Electronic Devices banish: In the bedroom is sleep-laptop, tablet or TV do not belong there. now slip into your pajamas and unwind from the rigors of the day!